Insight to No Sight will bring distinguished speakers to Laurier’s Waterloo campus to discuss accessibility in educational and corporate settings. The event, hosted by Wilfrid Laurier University Students’ Union club Eye to Eye, will be held on Thursday, Sept. 17 in the Maureen Forrester Recital Hall. The event, which hopes to eliminate stigmas associated with visual impairment as well as other disabilities, is free and open to anyone who is interested in learning about the strengths of visually impaired employees or students and how they can better support those with visual impairment. Dennis Atkins, executive director/CEO of the Disabled Citizens Alliance for Independence in Viburnum Missouri, an organization that provides services for over 2,000 people with disabilities. Atkins was diagnosed with retinitis pigmentosa in 1979 and has since become a long distance runner, completing 70 full marathons. Molly Burke, ambassador for The Foundation Fighting Blindness Canada. After losing her vision at the age of four, Burke became a motivational speaker, travelling throughout the world to speak about overcoming adversity and embracing diversity. Robert Pearson, accessibility officer for Accessible Media Inc. (AMI), an organization that improves the accessibility of digital media for Canadians. Mahadeo Sukhai, Canada's first blind biochemical researcher and head of the Variant Interpretation Group. Sukhai is also a senior advisor at the National Educational Association of Disabled Students (NEADS) in the area of Governance and Leadership Development. Jack McCormick, a second-year Business student, co-founded Eye to Eye in his first year at Laurier with Dana Toameh, a Laurier Health Sciences student. 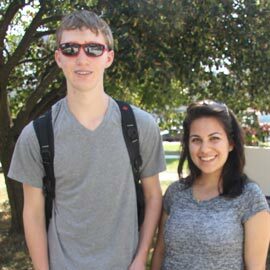 McCormick, legally blind since birth, and Dana, whose childhood friend was completely blind, began the process of establishing Eye to Eye in November 2014 in order to bring awareness about visual impairment to Laurier students. The event will be held in the Maureen Forester Recital Hall, Thursday, Sept. 17 beginning at 6 p.m.